Happy National Apple Day! Food holidays are so much fun because it gives me an excuse to play around in the kitchen where I normally wouldn’t. Apple season is one of the best. There is an obscene amount of them to go around, especially in the north, they’re inexpensive and they are SO versatile. Apples can be used for sweet or savory and nothing beats raw apple slices dipped in peanut butter for an easy snack. We’re going sweet today with an easy dessert recipe that will use up any extra apples lying around the kitchen. It’s very simple featuring baked apples, a streusel topping and vanilla ice cream to finish with perfection. Isn’t that just apple crisp, you ask? Not really. It’s the same idea except apple crisp cooks the filling in the oven and the topping is more cakey. This recipe cooks the apples about 90% of the way on the stove and the topping is more of a crumble than anything. It’s much more deconstructed which leaves plenty of room for error and personalization. For example, you can make one large dish of this and serve up a spoonful in bowls if you’re having company over. Or, you can do as I did and bake it in individual ramekins. If you don’t have individual ramekins and you want them, I got mine from Homegoods for $4 each. They’re made in Italy and the perfect size for desserts, pot pies, individual Shepherd’s pies and more. They’ve become my best friend. So how does this come together? Easy. Before you get to the apples, mix together the topping. You want it to chill a bit before baking so that it’s nice and buttery. Dice up or slice a few apples. I peel the skin off but you can leave it on as well. Mix it together with some sugar, spice and everything nice before bringing to a simmer on the stove. You want the mixture to get nice and syrupy, the apples to get soft but not so soft that they’re about to turn into applesauce. It might sound complicated but I promise, you’ll be able to tell while you’re cooking. 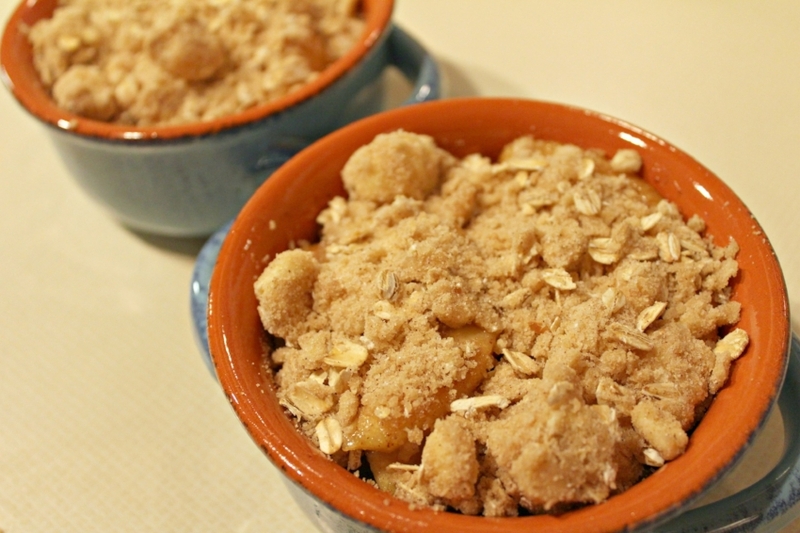 When the apples are ready, spoon into your ramekins or baking dish, top with the crumble and bake. You want to serve this warm so that the vanilla ice cream melts a little bit on top. It cuts the sweetness of the apples and crumble so that the dish is balanced in flavor. It’s decadent and delicious with all the perfect fall flavors. 1 - Prepare the apple crumble. 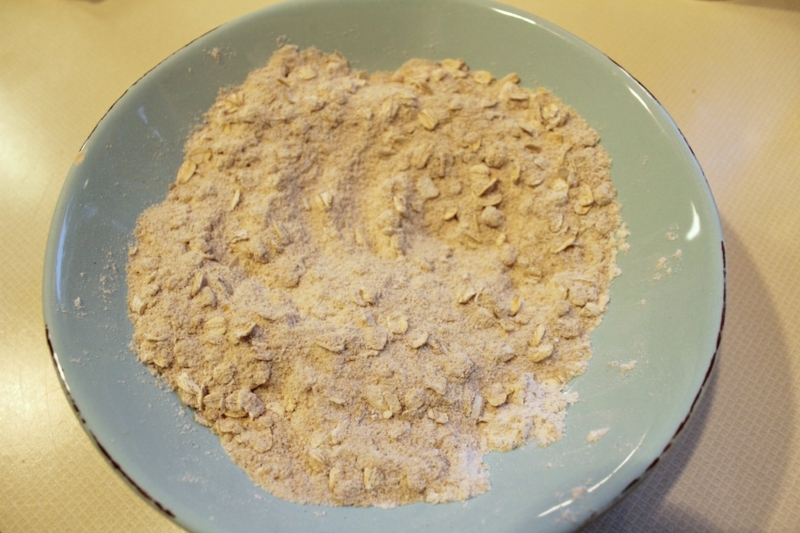 Mix together the flour and oats. With a fork or pastry cutter, cut the butter into the dry ingredients until it becomes a crumbly mixture. It’s ok if you have large chunks of butter in there. The result will be amazing. Add the brown sugar and cinnamon, mix until just combined. Place in the fridge or freezer for 25-30 minutes. 2 - Preheat the oven to 400 degrees. In a large saucepan, mix together the apples, brown sugar, granulated sugar, cinnamon, nutmeg ground cloves, butter and lemon zest. Cook over low-medium heat until the apples have released their juices and created a syrupy consistency and the apples have softened slightly. 3 - Spoon the apples evenly into each ramekin or into a round baking dish. Top with the crumble and bake until bubbly and browned on top, about 15-20 minutes for individual ramekins and 25-30 minutes for a round baking dish. Top with ice cream and serve. Want more apple? Check out our recipe for Mini Apple Cinnamon Loaves, Apple Cinnamon Galette, Jack o’Lantern Apple Hand Pies or if you just want a classic Apple Crisp, we have a recipe for that too! Want a few savory options? Try our Potato Pancakes with Homemade Applesauce or Butternut Squash & Apple Soup.